... yumminess ensued. Whenever I am in Beijing, I always get lamb kabobs... the spiciness of the cumin plus the gaminess and tenderness of the lamb... Mmmm... Anyhoo, here is an American version of lamb kabob (or yangrouchuan). Warning: do not follow this recipe as first, I did not have skewers, and second, I did not have a grill... so it is very much a bastardized version. I saw these pictures on a website today. They are day laborers working in the Chinese boomtown of Shenzhen. They haul bricks for a living... some of them have been hauling bricks for decades. They probably make no more than US$100 a month, if that. The glittery buildings in China are literally built on their backs. The temperature is over 100 degrees ... or 41 Celcius. Most laborers live far away from their families in shabby dorms and they go home only once a year for the Spring Festival. Pedal pedal pedal... Yay, I know how to ride a bicycle now... the wind feels so good in my hair, yipeeeee, go Cat! Eh, curb in front, need to turn, not enough time, brake, brake, ahhhhhh!!! Crash. Bang. Splat. Waaahhhhhh! Sigh. No pain, no gain. Anyhoo, tks C and D for letting me borrow your spare bike... here is the little rubber squeaky whale on the handlebar. Chop the tomatoes into large chunks, beat the eggs and shred the seaweed.. When water is boiled, put in tomatoes, seaweed and dried shrimp, when it comes to boil, let it cook for a minute or two, then toss in the egg batter and stir well... add chopped spring onions and turn off heat. Season it with salt and a little bit of sesame oil. Here it is: tomato, seaweed and eggdrop soup. 1. Never accept initial offers, especially on big ticket items, even at places that you normally would never bargain. For example, I was browsing for a new coffee table at Macy's. When the sales associate told me the price, I let out a frown, and nodded ... he then immediately said he could give me additional ten percent off. 2. Always google for coupons when you do online shopping. Alright, I confess, I spent $$$ at jcrew.com today, bad bad Cat. But at least I got free shipping. I googled jcrew coupons, and voila, the coupon popped up. Also, I was purchasing tickets to see Romeo and Juliet at the Dorothy Chandler, and I googled for coupon, and got premier tickets for less than the price of second tier tix. 3. Shop for groceries (veggies, meats and seafood) at Asian markets (Chinese and Korean, not Japanese which tend to be more expensive). Never ever shop at Costco's unless you are the Octo-mom! They make you buy so much, I usually end up throwing away stuff or get tired of it before I finish. What a waste. K, happy bargain hunting! As for myself, need to go patch some worn out clothes now! I got a little beach cruiser today! Yay! 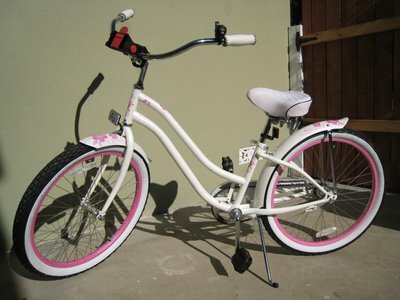 It's super cute, with white fenders and pink flower stencils, oh I also got a little white basket to go with it. The only problem is, I do not know how to ride a bicycle. But I am going to start learning today. At this rate, I am confident I'll be ready for next year's Tour de France. Ding dong ding dong, move aside Lance, Princess Cat coming through! 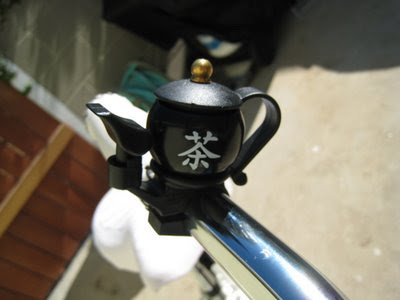 Here is the little tea cup ding dong bell. Isn't it cute? Decadence under the Red Flag: the rich and powerful sipping on tea and cocktails under red flags at a posh hotel in Beijing. Kind of contradictory, huh? Kir Royale before flight: I guess I am not a member of the proletariat anymore. Here is for you P: egg custard and sourmilk in mall underneath the posh hotel. In China, guess Asia in general, hotels are usually part of a humongous complex composed of shopping area, office area and dozens of restaurants. This one is no exception. I practically never left the hotel complex during my stay.